You've probably never heard of the Philadelphia Wireman. In today's art world, outsider art is both loved and scorned, depending a great deal on who you ask. But combine the lure of outsider art and the appeal of anonymity and you have the recipe for artistic success that has been capitalised on by the Philadelphia Wireman - and, more importantly, by art dealer and collector John Ollman. Ollman first found the pieces when he was introduced to Robert Leitch, who had built up a strange and mysterious collection of seemingly abandoned art objects. Leitch had stumbled upon them in an alley on the night of garbage collection back in 1970s, meaning that if he'd been an hour later the 1200 plus objects would likely have disappeared into the compactor of a Philadelphia city garbage truck. Virtually nothing is known about the artist, but that hasn't prevented any number of collectors and dealers from speculating about the pieces. 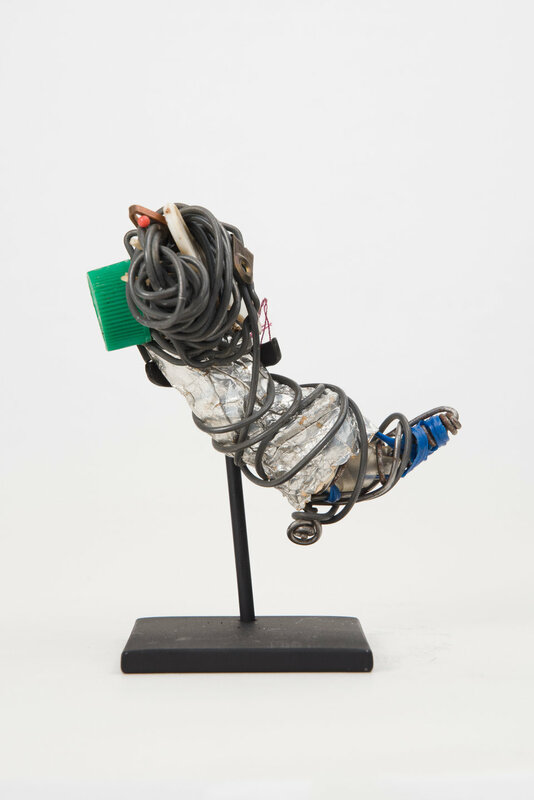 Most are quite small, a collection of garbage, off-cuts and plastic odds and ends all wrapped together tightly by strands of bent wire that encase them and tie them together. Dotted with bottle caps and strands of masking tape, there is something deeply powerful and slightly unsettling about the creations. Ollman, naturally, bought almost half of Leitch's collection as soon as he saw them, and soon returned to make sure he bought the entire set, and it didn't bother him at all that nobody had any idea who the Philadelphia Wireman was. "People are so locked in to having to know who made something. It’s this weird part of the commercial art world -- if you don’t have a name on something, it doesn’t really have value. I never felt that way about them. I wish I could put a name to them but I can’t; it’s not as if I didn’t try really hard." Surprisingly enough, the story of the Wireman has been told in the form of a graphic novel (named Wireman, unsurprisingly), although many other outsider artists are unlikely to have their stories told in the more conventional art world. Here's hoping that those artists working on the fringes of the art world will be discovered by the rest of us, adding new depths to the dialogs and shaping the course of other's artistic expressions - or not, if they would prefer to toil in the shadows.